Oxiracetam CAS number 62613-82-5, which is a derivative of piracetam, its main effects include the following aspects: 1. Promote the synthesis of phosphatidylcholine and phosphorylethanolamine, and improve the ATP/ADP in the brain. The ratio increases the synthesis of proteins and nucleic acids in the brain; 2. enhances the plasticity of the brain, strengthens the synaptic formation, improves the memory and learning function of patients with Alzheimer's and memory disorders; 3. Reduces cerebral vascular resistance, inhibits Platelet aggregation, improve microcirculation and increase blood flow in brain tissue; 4. Promote the neurotoxic effects of excitatory amino acids in damaged nerve cells. It is suitable for the treatment of brain damage and its neurological deficit, memory and intelligent disorder. It is especially suitable for senile dementia. It can also be used for the rehabilitation of brain diseases such as neurosis and encephalitis. The molecular conformation of oxiracetam exists in the case where the hydroxyl group and the carbonyl group are located on the same side and the opposite side of the pyrrole ring, whereas in the prior art, the oxiracetam which is different in the two spatial conformations cannot be separated, so When the hydroxyl group and the carbonyl group of sitan are located on the same side of the pyrrole ring, it is easy to form intramolecular hydrogen bonds, which causes the solubility of oxiracetam in the water for injection to be reduced, especially affected by storage time and ambient temperature. 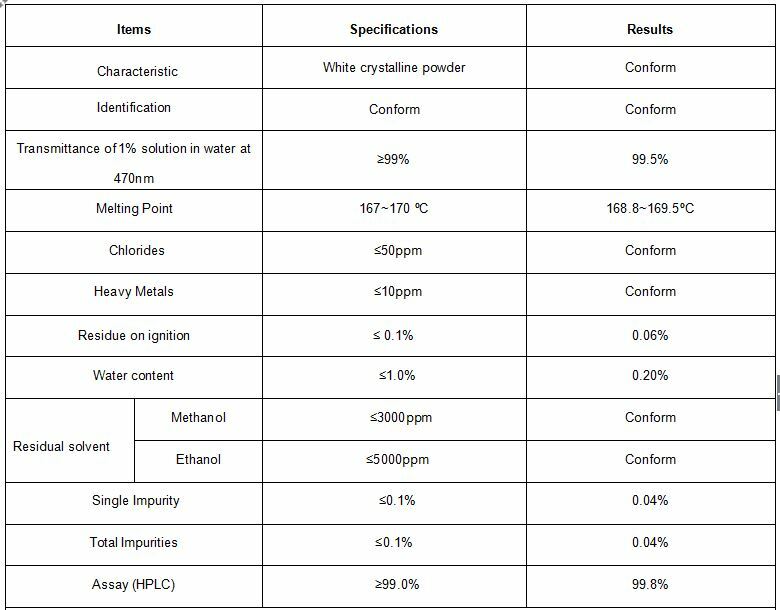 There is a case where white crystal powder is precipitated from the injection. In addition, in the actual production process, oxiracetam 62613-82-5 needs to contact the metal container and dissolve when heated to 40-60℃, and also needs to undergo high temperature for sterilization, so trace amounts of metal ions are detected in the finished injection. Since these metal ions themselves have the function of oxidizing hydroxyl groups, the content of related substances in the injection liquid increases with long-term storage, especially in extremely high temperature weather storage, the influence of such oxidation on product stability is not negligible. Usage: Oxiracetam (CAS62613-82-5) is a kind of active Pharmaceutical ingredient mainly used for manufacturing nootropic drugs of the recetam family. Looking for ideal Brain Damage Treatment Oxiracetam 62613-82-5 Manufacturer & supplier ? We have a wide selection at great prices to help you get creative. All the Oxiracetam DMF Cas 62613-82-5 are quality guaranteed. We are China Origin Factory of CAS 62613-82-5. If you have any question, please feel free to contact us.